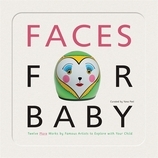 Faces for Baby, the highly anticipated follow-up to Art for Baby, showcases some of the contemporary art world’s best-known artists. As faces have been scientifically proven to be among the first images a baby can understand, each page features a different face, with the added surprise of the baby’s own face reflected in the mylar mirror on the final page. This multicultural selection of works is sure to appeal to art-lovers and babies alike! "Inspiring little minds with big ideas -- what a brilliant concept. This is an excellent way to start sharing the world of art with your baby." Yana Peel co-founded the Outset Contemporary Art Fund in 2003, and is a patron of the Asia Art Archive. She lives in Hong Kong, China.